Since coming to power in late 2012, president Xi has launched high-profile campaigns to rein in the behaviour of wasteful and corrupt civil servants whose antics, he believes, could ultimately bring the Party down. Those efforts have now spread to the fairways of southern China, with Guangdong’s anti-corruption agency announcing its ban on Sunday in an edict entitled: “Strictly guarding against golf club corruption”. The prohibition was designed “to prevent unclean behaviour and disciplinary or illegal conduct,” according to a notice posted on the group’s website. The decree means virtually all golf-related activities are now proscribed. Officials can no longer jet off on golf-related junkets, engage in golf-related betting, play golf with people connected to their jobs, hold positions on the boards of golf clubs or societies or even acquire golf club membership. A brief commentary on the anti-corruption agency’s website described golf as an inappropriate and potentially subversive pastime for Communist officials. “If government workers become keen on this “noble” game, it might bring about bad consequences such as making them detached from the masses or even corrupt,” it warned. Golf.com’s Pete Madden followed up on the story, quoting me. 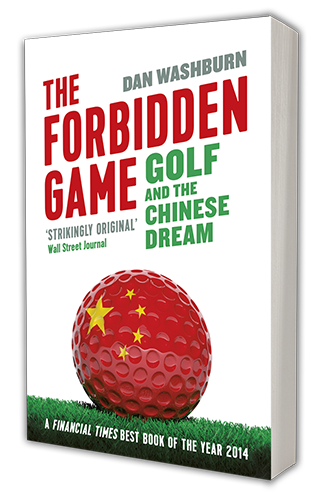 Dan Washburn, managing editor of the Asia Society and the author of a new book about golf in China called “The Forbidden Game: Golf and the Chinese Dream,” said local crackdowns are not new, but what makes this one significant is its location. The new rule’s potential impact, he says, will depend on enforcement. Since the 2004 moratorium, for example, more golf courses have been constructed in China than anywhere else in the world.